CRESCO – For those who are interested in “where they came from” and tracing their ancestral roots to “where it all began,” Eileen Tlusty, of rural Protivin, is one of the fortunate ones. Tlusty took part in a trip, one of many to the Czech Republic, in September and October 2012 with a definite mission: to physically visit the home of her ancestors. She was more than successful. CRESCO – Three prestigious awards were presented by Times Plain Dealer Publisher Dan Evans on Wednesday, April 11 during the Howard County Business & Tourism (HCBT) annual banquet at the Cresco Country Club. Awards included: “Organization of the Year,” “Citizen(s) of the Year” and “Hall of Fame” inductee(s). Honorees were chosen by a selection committee comprised of HCBT and newspaper staff members, and based on strict nomination criteria. Nominations for the awards are accepted on an annual basis. Rules and regulations routinely run in the January and February editions of the Times Plain Dealer. PROTIVIN – Masopust is a traditional Czech Mardi Gras celebration that takes place in Czech communities around the world the first weekend before Lent. The small Czech village of Protivin, Iowa, is no exception and this past weekend the halls of the Protivin Community Center were overflowing with merrymakers. 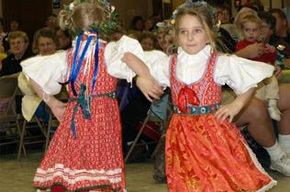 This year marks the sixth year Protivin has played host to festival-goers and you didn’t have to be Czech to be there. PROTIVIN - The town of Protivin received a nod to its cultural heritage on the evening of Thursday, Sept. 1 with the performance of Camera Chabra, a Czech choir, at Holy Trinity Catholic Church. The Czech Heritage Partnership and the Foreign Ministry of the Czech Republic presented the 20-member choir in Protivin during the choir's 2011 tour and visit to the United States. Among the local members of the Czech Heritage Partnership are Vice President Eileen Tlusty; President Gene Kovarik; Steven Klimesh, past president, and Michael Klimesh, founding president and director of the Czech-North American Chamber of Commerce and Culture. The choir's stop in Protivin was borne out of a visit to the Czech Republic last year by Tlusty and Michael Klimesh. While there, they stayed with Jirina Siklova. Recently, Klimesh received an e-mail alerting him to the choir's U.S. tour, requesting that he help arrange a visit to the Czech-American communities of Spillville and Protivin, respectively. "We got our collective brains together and made it happen," said Klimesh of the choir's visit. "We arranged for housing, food, and showing the sites." Among the locations of interest the choir visited were the St. Wenceslaus Church and Bily Clock Museum in Spillville. Siklova, who introduced the choir's song selections during the Protivin concert, said she was impressed with the way Czech-American communities such as Spillville and Protivin kept their cultural heritage alive. "This is my first time visiting Protivin; my first time in the center of America," .she said. "I saw the museum in Sillville and St. Wenceslaus. When (Czech immigrants) arrived in America, it was very hard life for them, but they kept their music and their art. "they kept their music and their art." Camera Chabra was founded in 2005 by Vera Dousova, Ph.D. The choir's conductor is Professor Lubomir Matl of the Academy of Music in Prague and in Brno, chief conductor of the Rossini Festival in Pesar, the Opera Festival in Dublin, and other world festivals. In his introduction to the choir's performance in Protivin, Steven Klimesh said, "Camera Chabra has attained elevated status in the Czech Republic, preserving the language and folk culture of the Czech people." The repertoire of the choir consists of Czech national songs as well as classical and spiritual music. It participates in many music festivals throughout Europe each year. Since its inception, the choir has been supported by the Foreign Ministry of the Czech Republic not only because it performs widely in their Czech homeland, but also because due to the fact that they visit compatriots living abroad to familiarize them with Czech national songs. Following the Protivin concert, choir members and their host families enjoyed a meal, at the Protivin Community Center". PROTIVIN – On Saturday, Sept. 24, Dana Hunatova, the Consul General of the Czech Republic in Chicago, arrived in northeast Iowa to experience the area’s rich Czech culture in Protivin and to attend a world premiere piano concert in Spillville. 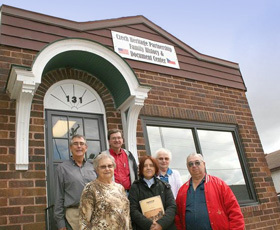 Hunatova’s day began in downtown Protivin where she visited the Czech Heritage Partnership Family History & Document Center, learning about the efforts of local volunteers in preserving the area’s Czech heritage. While there, Hunatova met the organization’s co-managers, JoAnn Dostal and Gene Kovarik, along with fellow volunteers Evelyn Schmitt and Linus Voves. The main reason for Hunatova’s visit to northeast Iowa was to attend the concert at Saint Wenceslaus Church in Spillville – a concert performed by Joan DeVee Dixon and Alice Fiedlerova, duo-pianists featuring works by the Czech Republic’s Antonin Liemann and Antonin Dvorak. The event highlighted the world premiere of three of Liehmann’s previously unknown manuscripts discovered by Dixon at the museum in Zlonice. Liehamann was a primary teacher to Dvorak in violin, voice, organ, piano and music theory. Dvorak, a highly celebrated historical figure in northeast Iowa, moved to Spillville in 1893 where he spent much of his time writing music on an 1876 Pfeffer Organ – the same exact organ played by Dixon during a special Czech Heritage Polka Mass that followed Saturday’s concert. In addition, members of the Protivin and Spillville choirs sang during the mass.